Those of you imaginary readers who have followed my blog closely from the very start might have noticed that I originally thought I would write a fair amount about sewing. Sewing was even in my tagline. When I started this blog, I was in the midst of a sewing obsession that swept through like a passing storm, fast and intense and leaving lots of unused fabric in its wake. I do still hope to get back to it sometime. So tonight I was happy to pull out one of my sewing boxes for my first ever attempt at shoe making. A piece of leather was hanging off one of my favorite shoes. 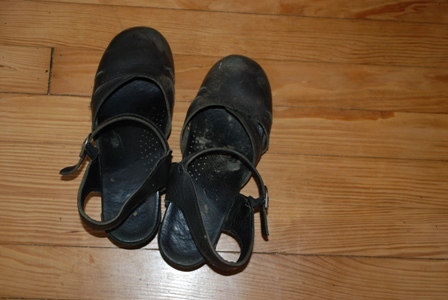 I pushed these Dansko’s to the limit all summer and then wore them in some wet muddy conditions this fall. 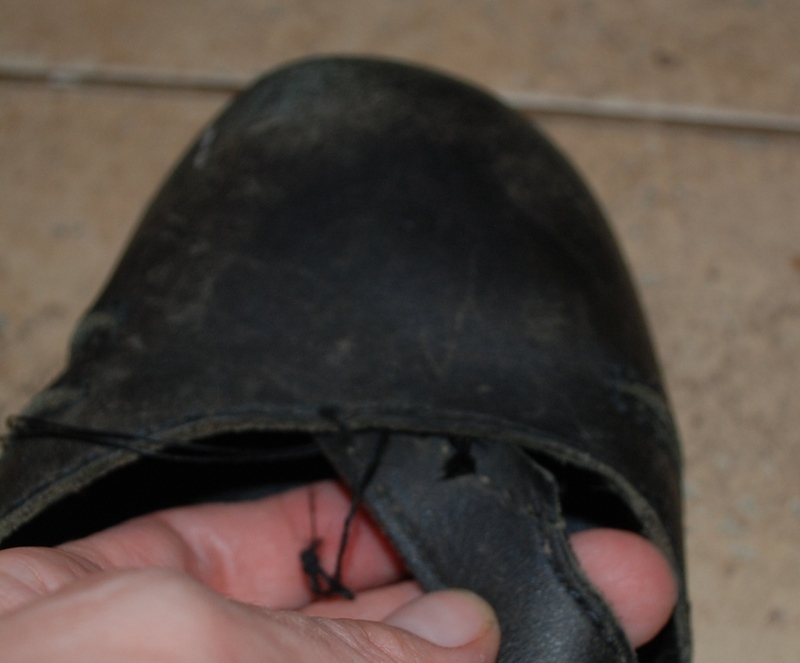 Finally, one of the straps came unthreaded and was hanging off the shoe. Very dangerous, especially since I am often carrying my toddler. “Aunt Lydia’s” brand button and carpet thread. 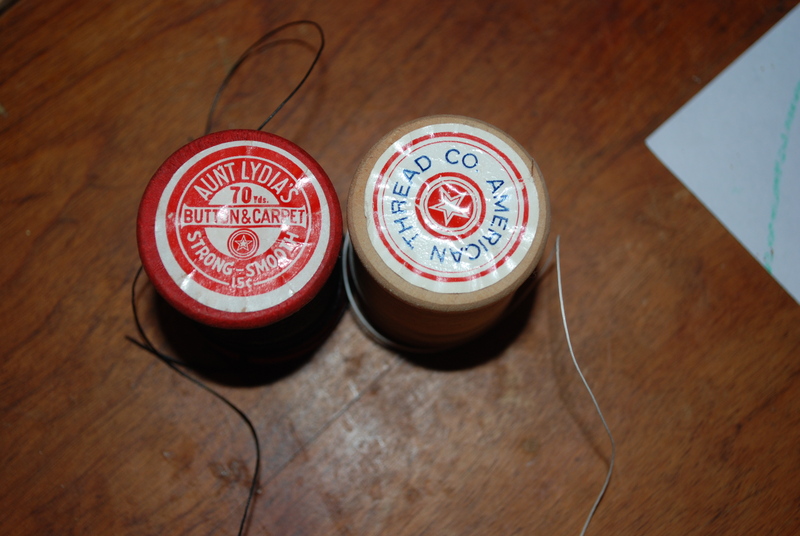 I was lucky enough to inherit a small stash of thread from her early century New York dry goods store. I want to write more about her spools of thread sometime. She was known for her excellent repairs and family legend says she would fix all the buttons and tears on the local policeman’s uniforms and in turn they kept an eye on her store. I love looking at the old spools of thread that connect me to her store and the past. It was actually easier than I expected, since I used the existing holes and a pair of pliers to pull the needle through. My children were riveted watching and I am quite sure my son will brag about his mother the shoemaker in pre-school tomorrow. I always feel so good repairing something instead of throwing it away or pushing it to the corner of the closet to gather dust. The shoes will be a little more special now that they have an imperfect but workable repair — and a bit of thread from my great grandmother’s store. Lets see how long it lasts! blog, blogging, Crafts and Creativity, DIY shoe repair, dry goods store, firsts, Jewish Life, New York, Parenting and Family, Sewing, shoemaking, shoerepair. Bookmark. Oh, I so remember Aunt Lydia’s and envy your stash! thanks for stopping by! I will eventually write more about it, I love the old thread collection. I also had a spool of Aunt Lydia’s, inherited from my grandfather, who had a shoe repair business in Rochester NY. I used the thread to repair doggie toys, but now I am out! Do you know if anyone sells the thread? Thanks.